September 19, 2018 - Siemens Mobility GmbH, part of Siemens AG, has opened its first digital rail maintenance center – the Siemens Mobility RRX Rail Service Center. 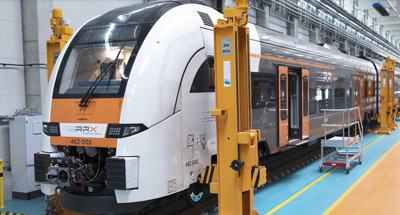 Located in Dortmund-Eving, Germany, the new maintenance depot offers the highest level of digitalization in the rail industry, with advanced FDM 3D printing from Stratasys (Nasdaq: SSYS) at the heart of the depot’s servicing operation. Stratasys is a global leader in additive manufacturing or 3D printing technology, and is the manufacturer of FDM® and PolyJet™ 3D Printers. The company’s technologies are used to create prototypes, manufacturing tools, and production parts for industries, including aerospace, automotive, healthcare, consumer products and education.